House insurance has never been easier. Get an instant house insurance quote and start cover all online. House insurance doesn’t need to be complicated, that’s why we give you a quote in seconds and insurance in a few minutes. Insurance cover for all the important stuff, including fire, storm, flood and earthquake and some extras like somewhere to live while we’re repairing your house and replacing your furniture. Instant home and contents insurance, no waiting for paper in the mail, manage your insurance and your claims from your personal dashboard anytime. Flexibility to change your insurance when you want, with New Zealand’s first Live Policy. Cover up to your selected replacement value. Buying house insurance is the easiest way for a homeowner to transfer the risk of unexpected damage to an another party, specifically an insurer. Its about swapping risk for some premium. The insurer will base the house insurance premium on a number of factors including location, age, water supply and use of the property. The homeowner can also modify the premium by choosing how much personal contents cover the excess they can live with. How much do I insure my house for? Insurers will put a limit on what they are prepared to pay. So the homeowner needs to get it right to avoid any financial exposure. Most insurers require the owner to set their own level of insurance for the house. The customer needs figure out what it would cost to rebuild the house, the land improvements (such as driveways, fences and pools) and allow for things like demolition costs and inflation. A common mistake is using the market value or ratable value of the home to calculate insured value – this is not wise. Learn more about calculating the replacement value of your home. Most home insurance policies provide automatic cover for earthquake, with assistance from the EQC. The Earthquake Commission (EQC) is a Government insurer designed to provide insurance for residential houses when there is a natural disaster. The EQC does not provide insurance for damage from flooding or storm events, only earthquakes and volcanic activity. Part of a house’s total insurance premium ($230) goes to the EQC to provide up to $115,000 of natural disaster insurance. If the natural disaster causes more than $115,000 of damage the insurer of the house will pay for the rest, up to their sum insured limit. Learn more about the EQC. Good house insurance policies have additional benefits automatically included. Sometimes referred to as policy extensions, these are benefits that are included in the policy such as alternative accommodation costs, covering the cost of the homeowner having to rent another property while repairs are completed. Gradual damage, caused by leaking water pipes over a period of time, is also a common benefit. Gradual damage often has a limit of cover, usually $3,000. How likely are our customers to recommend initio? User friendly site, reasonable pricing, caters to holiday rentals. So far I have no reason to complain about anything. When it comes to making a claim, Initio have amazing customer service. They were extremely helpful every step of the way. Good website layout, well written documents, good price. Good pricing, simple site to use, quick and easy. Easy, but would like to deal with a person when insuring such an important item. The online process is really easy. Easy to navigate website, friendly informative staff with quick responses. Suze Ferry is excellent to deal with. Great price and good service. Site was easy to get around. I have already recommended for another house. Always found easy to deal with and we have past and currently several policies with you. Easy to follow the instructions to re-new the policy and I recently had a claim due to power fluctuations. There were no issues or delays on your part and the money was in my bank within one week after the claim was made. Super quick and user friendly site, and initio include the things that really should be insured. Easy, also Initio dealt with our Kaikoura earthquake claims in a professional manner, and there were no hassles. Easy to use online service, great prices and have already recommended to others. I lodged the claim online late at night and was advised by 10am the next morning that the money was in my account. This was way beyond my expectations and allowed me to buy a new phone immediately. I have since told a number of people about my experience with Initio. I was very happy with the prompt service. 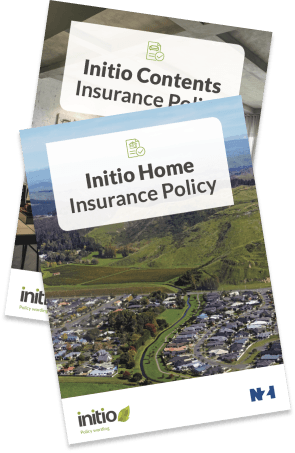 I found out about Initio because it is recommended at Property Investors Palmerston North. It gives me great cover for a reasonable price. Thank you. After 4 or 5 years as a client Initio is still the simplest insurer to deal with and has overall the best package to suit our needs. Cheaper. Have sent the info on to my 2 sons who own houses! Best value for money, compared to my previous provider. Also really easy and clear when signing up! I was very pleased with the whole claim process. I like that you are patient and that you were able to answer any questions that I had about the claims process. The claims process went smoothly which helped a lot when I was quite stressed over the house flood. Easy to obtain quote and then proceed with cover. Reasonable charges. Good response from Support. It's easy and Frank people are super friendly and easy to use. Always a pleasure to deal with and quick to respond to questions. Competitive pricing and easy to see what's due and pay via the online dashboard. Very effecient and friendly staff. The online claim form is very easy to use and convenient. Claims were easy and payments were quick. Due to these reasons, I have just renewed my policy for 2018-19 with initio. Ease of use and relationship with Bookabach. Very simple and straight forward to use and very cost competitive. We have had several rental policies with you previously and currently still two plus now our private home and have always found all dealings excellent. We believe we have good cover for reasonable premiums. For most people, their house is their most valuable asset. As with all types of insurance, you have choices depending on what types of insurance best suit your needs, and how much you are looking to pay for that insurance. Your property is likely to be your most valuable asset, so it goes without saying that you’d want to insure it. If anything were to happen, like a fire or natural disaster, it can be hugely stressful both emotionally and financially. information on keeping your home fire safe. Checklists for reviewing fire safety, tips for creating an escape plan, things to look for both inside and outside the home, and information on smoke alarms and other fire safety devices.